When I originally set out to make gingerbread men cookies, I didn’t really know what to expect. Would a recipe yield crispy cookies? Would it yield spicy cookies? I’ve had my fair share of overly spicy gingerbread men cookies, where the ginger just knocked me out of my seat. On the other hand, I’ve also had gingerbread cookies that lack flavor and just taste completely bland. Finding the best gingerbread men cookies turned out to be a real quest, but luckily one with fruitful results. Not only are these gingerbread men cookies perfectly spiced and sweet, they’ve got a slightly crisp exterior with a perfectly chewy interior, just the way I like them! The cookies are also very versatile in the sense that if you enjoy your cookies really crisp, all you have to do is roll them out thinner and bake them a minute or two longer. But if you’re after a chewy cookie, these gingerbread men cookies are wonderful as they are. I decorated my cookies with classic royal icing and, boy, were these little cuties yummy! 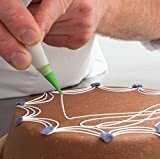 I do want to note, however, that using a pastry bag to pipe out the icing in a neat and pleasing way is pretty much essential for this recipe. You can use the DIY method of using a ziplock bag then snipping off a corner, but because the details are so minuscule on these cookies, it’s best to use a pastry bag with a fine tip. Or, if you really aren’t into decorating, you could just dip their hands and feet into royal icing and call it a day. The point is, they taste fantastic and that’s all that really matters! Chewy, tasty ginger-flavored cut-out cookies. Preheat oven to 375°F. Mix sugar and spices in a food processor or stand-up mixer. Add in flour, baking soda, and salt - mix. Add in molasses and mix on medium speed. Then add in milk. Add the butter cubes, and mix until dough starts clumping together and away from the sides of the bowl. Create a compact ball out of the cookie dough and flatten out into a disc shape. Wrap the dough in parchment paper and freeze for 20 minutes. Roll out dough on a floured surface with a floured rolling pin. Roll out to 1/4 inch thickness for chewy cookies, and 1/8 inch thickness for crispy cookies. Use cookie cutters to create gingerbread men. Bake cookies on a baking sheet fitted with parchment paper for 7 minutes for chewy cookies. For crispier cookies, bake a couple minutes longer. Rotate pan halfway through baking to make sure all the cookies evenly bake. Allow cookies to cool on baking sheet for a couple minute before moving them to a cooling rack to completely cool. For the royal icing, whisk the egg whites, lemon juice, and powdered sugar together, stopping the mixer to scrape the powdered sugar off the sides of the bowl. Whiski again on medium-high speed until icing is thick and stiff. Use a pastry bag with a fine tip to pipe icing onto gingerbread men. Oh my I absolutely LOVE this recipe!! !